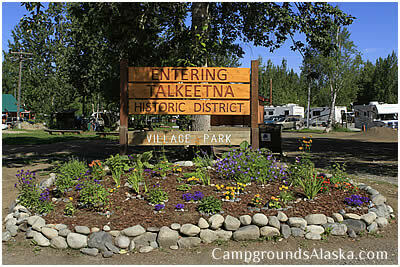 Talkeetna Alaska Campgrounds and RV Parks including where to see the best views of Mount McKinley in Talkeetna AK. Information on Talkeetna AK including the city parks, local attractions, travel tips, photographs and tours of Mount McKinley too. Talkeetna is a popular destination with cruise passengers and is included in most all of the extended land tours offered with any Alaska cruises. While there are plenty of reasons to include Talkeetna in your vacation plans there are some that jump out and say this is a must visit destination. Tent camping in Talkeetna Alaska is offered at the city park located at the end of E. Main Street. There are about 20 campsites for tent campers but no RV's are allowed at this site.